First of all, congratulations on converting calls from your dream B-schools! Hard work has led you to this and you now have the power to select between the B-schools that you have converted. This is a very important decision since a B-School opens the door to your future career. Hence, start analyzing early and take your time to make the decision. When I was faced with a similar dilemma of choosing between B-schools, i.e., between MICA and NMIMS, I formed a WhatsApp group with people facing the same choices. This allowed us share information obtained from various sources and discuss and include any criterion one may have left out while comparing. Above all, it let us be aware that there are other people facing the same conundrum too! But a word of caution here: Don’t let your decision to be swayed by any biased opinion. Always request the reasoning behind a fellow candidate’s decision. Always gather your facts from experts and official reports. I spoke to the professors at my coaching institutions, alumni at various stages of their career and current students of the college. Even though you may have your preferences, be open to hear conflicting opinions while analyzing so that you will not question your decision in the future. If you have decided to go for Marketing, be aware that you are potentially speaking to marketers very good at selling their college to you! After a thorough Google search, I decided the most important criteria for me. I suggest you come up with your own list of what criteria are most important to you. Apart from what I have chosen, you may also include student exchange opportunities and the difference between degrees obtained if it matters to you. As you can see, this comparison led me to a dead end with MICA and NMIMS scoring 6 each. Hence, I went ahead with my analysis by comparing the job roles offered, what I would like to learn, and what I can compromise on. I compared job roles offered in general for someone with my experience in NM and in MICA. Understand that this is subjective and may change according to the industry’s requirements each year. But a general idea of the type of roles offered and what you might fit into will help. Use LinkedIn to understand possible career path for someone who started with these job roles. 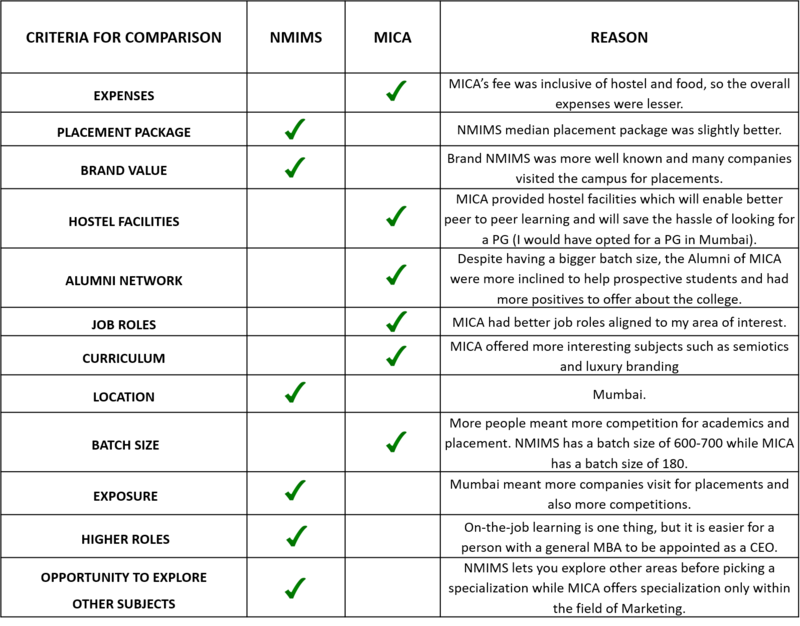 I found that the roles offered at MICA demanded more creativity and also provided a direct chance to understand consumer behavior and hence MICA scored for me here. Attending a calligraphy class at Portland’s Reed College eventually inspired the elegance for which Apple computers are renowned. “If I had never dropped in on that single course in college, the Mac would have never had multiple typefaces or proportionally spaced fonts.” – Steve Jobs. It is the intangible aspects of a brand that make them iconic. An alumnus who was out of MICA for 10 years told me that the different subjects offered such as Semiotics, Consumer Behaviour and Consumer Insight Mining help in intuitive understanding of the intangible aspects of a brand from real examples. I believe this will help in translating a marketing or business problem into a consumer problem which is the key to any successful brand. There is absolutely no doubt that I stood a chance of getting better placements at NMIMS. But this was only at the beginning and 3-5 years down the line difference between these two brands or the difference between the packages did not exist. Remember, your first job is not your last job and placement is not completely tied to your academic performance. Hence, with the belief that if I had to get lucky I will get lucky at both places, I decided to compromise on the variation in placement packages. Also, I was a 100% sure that Marketing was what I wanted to pursue hence I could let go of the opportunity to explore other subjects as well. Hence MICA scored again and I happily pick MICA over NMIMS. I request you to be very diligent while comparing, do so with an open mind and compromise on only what you can compromise and not on others. Neither college is a bad choice and it is no mean feat to land admission in these two colleges. Hence I ask you to trust yourself and make the decision that will suit your interests and aspirations. Hi Shruti, thanks for writing a wonderful article. Reading the headline, I thought it must be just another article but you proved me wrong. Could you please elaborate when you say that role offered demanded more ‘creativity’ – I am in search of this answer because I myself look towards marketing for this very reason. Hi Snigdha! I will try to clear your query with one of the roles MICAns get through placements: Brand Manager – which may involve coming up with a marketing strategy, advertising channel and message, product ideation and development, consumer insight analysis. There are other roles such as Account planner at an advertising agency which demand creativity too. 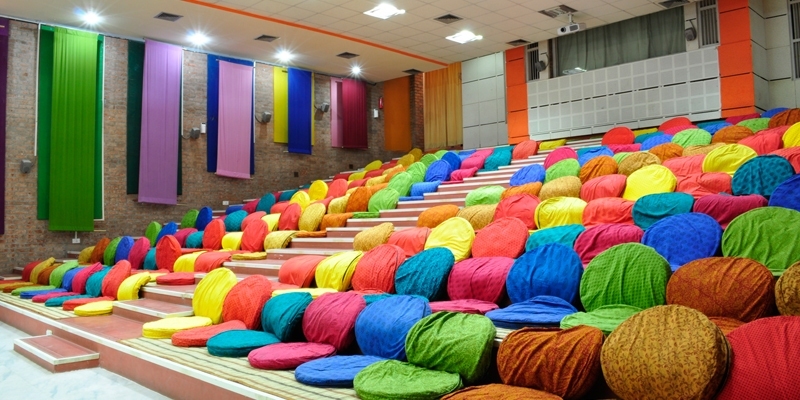 The pedagogy of MICA is such that equal importance is given to logical thinking as well as creativity which enables MICANs to get roles that are not offered at other B Schools. If you’re an aspirant, have a look at the placement reports and Google responsibilities of roles to understand more about them. Good luck! Very informative and articulate work!